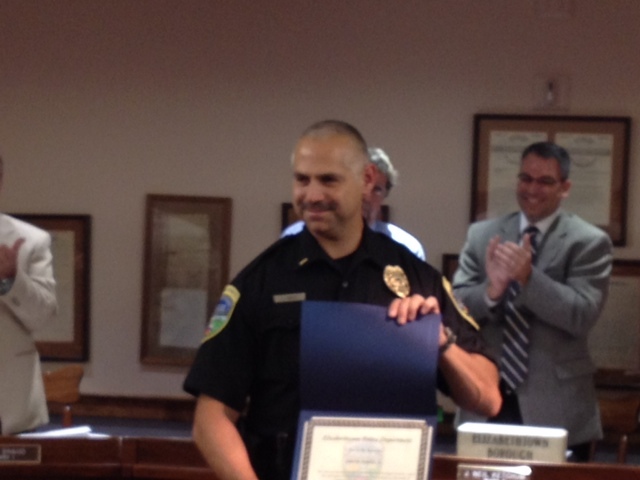 Elizabethtown Borough Council promoted Elizabethtown Police Detective John Emerick to the position of lieutenant Thursday, Aug. 16. The promotion makes him second in command of the police department. Emerick joined the department in 1991 as a patrol officer and most recently served as a detective. He had been in his latest role since April 2006. During his career, Lt. Emerick has served as an accident reconstructionist, specializing in advanced accident investigation. In September 2006, he was recognized for an outstanding investigation and subsequent handling of a fatal vehicle accident in the borough. His expert knowledge about accident investigation also led to instructing crossing guards and the Elizabethtown Area School District's driver's education department in various safety programs and training sessions. In 1993 and again in 1997, the school district recognized Emerick for the instruction he provided to the driver's safety department. Most recently, he was a Safety Committee representative for the police department and is one of the department's firearms instructors. A Commendation of Merit in December 1995 for assisting with providing CPR and first aid to an older man who had collapsed after chasing several juveniles who had committed disorderly conduct. Distinguished Unit Citation in July 2006 for assisting with an aggravated assault involving a firearm. The suspect was identified and arrested within a few hours. Distinguished Unit Citation in June 2009 for assistance during a fight that involved firearms. Working with other officers, Emerick was able to identify, locate and arrest the perpetrators within a few hours. Letter of Commendation in October 2009 for his investigation and arrest of an arsonist who set eight vehicles, a storage shed and several trash containers on fire, causing $60,000 in damage. Letter of Commendation in September 2011 for service provided to the community during the extreme flooding that occurred during Tropical Storm Lee.